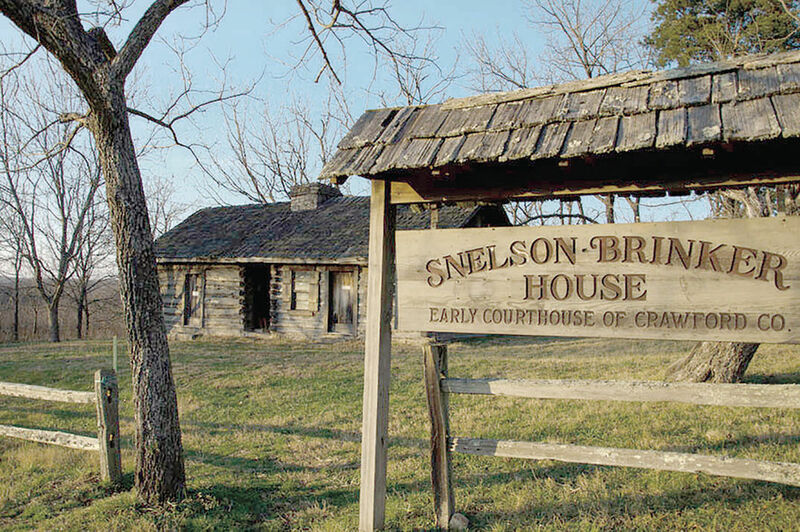 Prior to its 2017 burning, the Snelson-Brinker Cabin was the oldest building in Crawford County and site to several historically significant events in the 1830s. Executive Director Steve Belko, left, and Archaeologist Erin Whitson of the Missouri Humanities Council are leading the restoration effort at the Snelson-Brinker Cabin along with Frank J. Snelson, a seventh-generation descendant of the cabin’s original owner. Independence Day turned tragic two years ago when in the span of a few hours the 183-year-old Snelson-Brinker Cabin was mostly destroyed by an unknown arsonist. From the ashes of that loss a brighter future is today developing for the historic site. Missouri Humanities Council is committing to saving what’s left of the cabin. If a federal grant is additionally obtained, the effort may also bring jobs to St. James through the construction of an official Trail of Tears interpretive center. Belko says an announcement on the grant’s awarding is expected in the second half of this year. He adds the project’s development is guided by a five-member advisory committee of Native Americans. If the grant is not obtained, Belko says Missouri Humanities Council is committed to at least saving the surviving chimney and foundation at the cabin. Members of the Missouri Chapter of the National Trail of Tears Association saved the chimney from collapse last year by erecting metal supports and tarping it over. Belko says the public will have many opportunities to get involved and learn more about the Snelson-Brinker Cabin going forward. Donations for the project can be made directly to the Missouri Humanities Council’s Missouri American Indian Heritage Fund. A local outreach event is planned for May and the Missouri Humanities Council will host its October board meeting at the Public House in St. James. A documentary film about the Snelson-Brinker Cabin will also be aired on public television sometime this year, along with screenings in designated local communities. The Missouri Humanities Council’s efforts come with the endorsement of Frank J. Snelson, a seventh-generation descendant of the Snelson-Brinker Cabin’s original owner, Levi Lane Snelson. He was named by then Missouri Attorney General Josh Hawley as receiver for the property following the 2017 fire. The site was previously under the ownership of the Saint James Historical Preservation Society, but that organization was effectively defunct before the blaze and hadn’t conducted official business since 1991. “It is humbling to know there are people far flung from Missouri who are enthusiastic about saving this site and seeing it become vital part of our shared heritage,” Snelson says. He recounts four historically significant stories converged at the Snelson-Brinker Cabin in the 1830s. First, Levi Lane Snelson traveled to Missouri with the Snelson and Brinker families in 1833 as some of the region’s first permanent settlers. The cabin they built in 1834 served as Crawford County’s first courthouse at a time its jurisdiction included all of Phelps County’s area as well as part of Dent County. At the time of the settler’s arrival the Maramec Iron Works was also operating down the road as one of the region’s most significant economic developments. In 1837, Abraham Brinker purchased the cabin and soon after his two-year-old daughter was found drowned in a nearby creek. Mary, a slave owned by the family, was subsequently convicted of murder and sentenced to hang. However, the ensuing appeals process went all the way to the Missouri Supreme Court and a new trial was ordered. Upon being convicted again, Mary became the youngest person ever hung in Missouri. Her exact age isn’t known but various sources list it anywhere between 13 and 16. The Snelson-Brinker Cabin was also home to the B.B. Canon detachment of Cherokees during their forced march west on the Trail of Tears. They camped there from November to early December 1837. While on the property four Cherokees died and are buried there today. In 2006, the National Park Service certified the location as an official site on the Trail of Tears National Historic Trail. Missouri Humanities Council Archaeologist Erin Whitson says in addition to the site’s interpretive opportunities, it may hold even more lessons to teach us about our past.